When Karen warlord Saw Mote Thon is not busy fighting in what is called ‘the world’s longest civil war’, he likes to tend his garden wearing only orange boxer shorts and a plain T-shirt. Join Hans Hulst, the editor-in-chief of news magazine Frontier Myanmar, on a hilarious yet dangerous road trip deep into the long-troubled Kayin State. In the past, the last leg of the 150-kilometre long journey between the state capital Hpa-an and Myawaddy was a stop-and-go experience, depending on the day. The road over the Dawna Range, a mountain strip that covers eastern Myanmar and northwestern Thailand, was so narrow it could only handle one-way traffic. Traffic travelling in the opposite direction used the road on alternate days. With the opening in early 2015 of the newly-built Asia Highway 1, subsidised by the Asian Development Bank, travel times have shrunk considerably. But new nuisances have emerged along the road. There are at least six illegal checkpoints where soldiers ask for a toll, their guns at the ready. The aim is not to provide security but to relieve travellers of the contents of their wallets. After yet another checkpoint and payment of K5,000 Kyat (about US$5) even our usually restrained driver grumbled. “This is ridiculous. It’s like highway robbery!,” he shouted. Not everybody sees it that way. A Karen National Union official quoted earlier this year in a leading newspaper, The Irrawaddy, had a different perspective of the “highway robbery”. 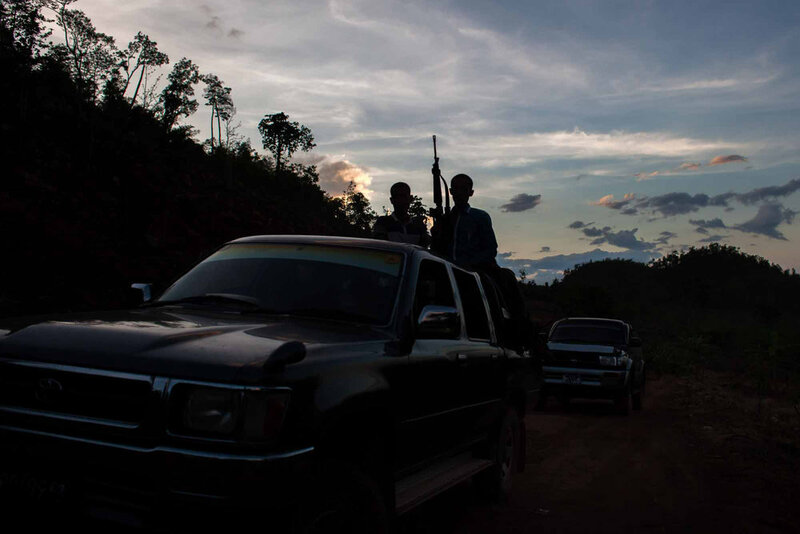 The KNU, which was in active rebellion from 1948 until it agreed a ceasefire in January 2012 with the new government, did not tax drivers, the official said. Travellers were merely “offering financial gratitude out of their own accord,” he told the newspaper. 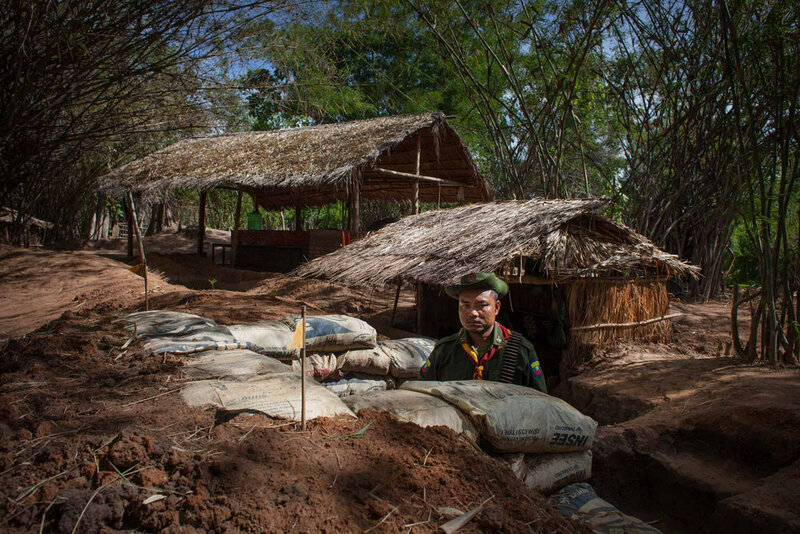 Although there are plans to levy an official highway toll, it is not exactly clear how the government intends to end the shady shakedown of drivers by soldiers from armed ethnic groups along the new road in Kayin State. For now any armed rebel group can pretty much do as they please. Later Major Saw Mote Thon invited us to the command centre of DKBA Border Guard Force Battalion 1022, an orderly compound where his troops live in neatly maintained barracks. “I learned to appreciate the importance of cleanliness during a visit to Japan,” the Major said, while carefully tending his garden in orange boxer shorts and a T-shirt. the rebel leader said casually. The atmosphere in the rebel army compound was pleasant. We drank coffee on a small wooded hill overlooking the valley, while two armed soldiers stood guard. The Major pointed to a hill nearby. “There’s a couple of our soldiers up there right now, to prevent snipers from setting up there and taking aim at me,” he said casually. In theory, relations between the Karen National Union and the DKBA, which broke away from the KNU in the mid-nineties, are cordial. A Karen Unity and Peace Committee acts as a coordinating body among all armed Karen groups and the KNU and the DKBA intend eventually to merge into one organisation again. The Major had devised a medieval punishment for soldiers who get drunk. Drunk fighters are lowered into a deep, natural cave on a rope and must wait in darkness for 24 hours until they are sober again. Sometimes they encounter snakes in the cave. “I will show you how it works.” He ordered one of his men to be lowered into the dark pit. Then he asked the poor soldier to climb up the steep walls. The Major extended his leg to lift his underling out of his precarious position, ostensibly in an effort to show us that he was a truly benevolent and powerful man. The colourful Major clearly runs his battalion with a firm hand. He seemed friendly on the surface, but showed his tough side as well. In fact, he behaved like a big, moody kid. On our last day with Battalion 1022 it seemed the Major was unwilling to pose for an official portrait. He wanted to get rid of us. But suddenly his mood shifted and he decided to treat us to a show the likes of which we had never previously seen. He dressed up in his uniform, went around instructing soldiers, guiding construction work, cutting banana fronds with a machete, laughing, and chopping big logs of wood. Then Maj Saw Mote Thon grabbed an automatic gun and posed for a picture, donning a smile that would have fitted a movie poster. After the circus act we sat down on the ground together and ate curry with our hands. we sat down on the ground together and ate curry with our bare hands. The Major is held in high regard by his men. That became clear once again when we visited one of the battalion’s field positions on the last day of our stay. 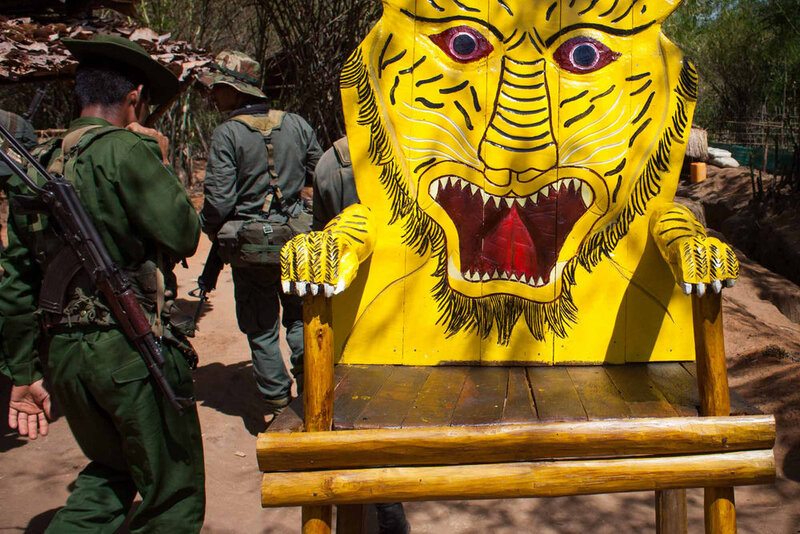 The platoon that is patrolling the area had built a chair in the shape of a tiger for their commander. At the battalion’s central command the major staged a mock battle for us to take photos. His men responded automatically to the Major’s orders while he threw rocks into bushes to simulate the presence of imagined enemies. It was an uncomfortable scene to watch grown men being used as pawns on a chessboard. The clout of the armed ethnic groups in negotiations with the government depends partly on how many troops they have, or say they have. Arithmetic can be a challenge for Maj Saw Mote Thon. One day he claimed Battalion 1022 comprised 400 men, the next day its ranks had swollen to more than 800. Myanmar Peace Center officials declined to confirm either number because of the sensitive nature of the information. A foreign expert close to the armed Karen groups, who declined to be named, said that the Karen routinely overestimate their strength. The creation of the Karen Unity and Peace Committee to foster harmonious relations among the rebel groups does not mean that hostilities have ceased. At a house in a DKBA Border Guard Force compound in Myawaddy near the profitable border crossing to Thailand controlled by the group, we met Captain Ko Zaw Oo. The captain was recovering from a injury suffered during a skirmish in the Karen hinterland. 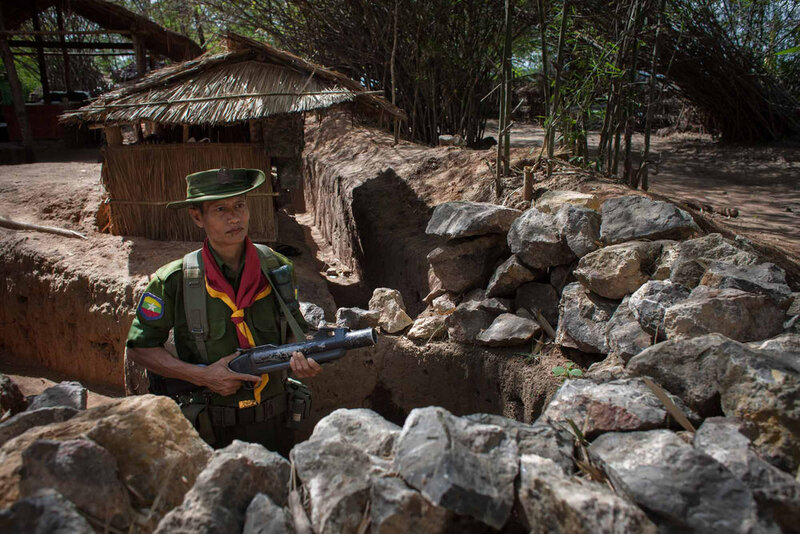 “The Karen National Liberation Army, the armed wing of the Karen National Union, shot a monk recently,” said Capt Ko Zaw Oo, seated on a bamboo mat. “On April 10 we entered their area with a small platoon of seven DKBA soldiers. We ran into an ambush. About 40 KNLA soldiers attacked us. I was wounded in my leg by shrapnel.” He removed the bandage from his calf and foot to show where the metal fragments had entered his body. Attracting investors is no guarantee of success though. Maj Saw Mote Thon said a foreign consortium had built a big garment factory on DKBA land near Myawaddy that was expected to employ 4,000 people. 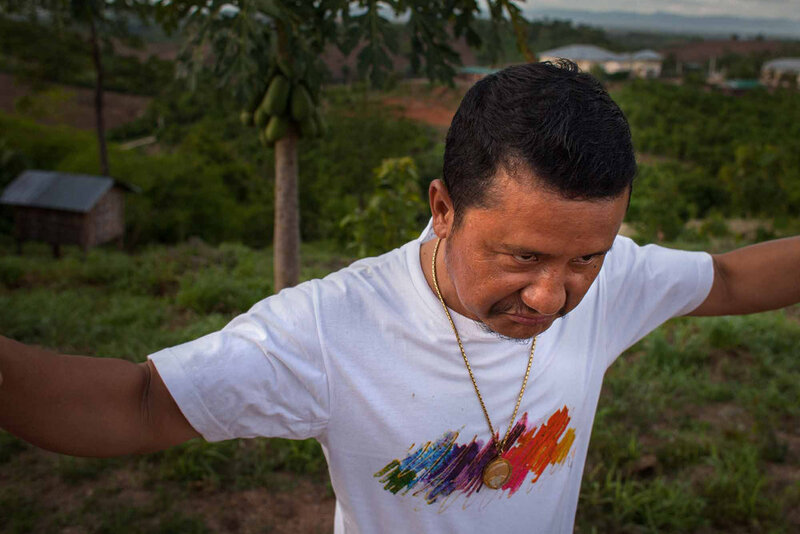 The factory was, however, unable to acquire an operating permit and was relocated to an established industrial zone, shattering the hopes of Maj Saw Mote Thon and his DKBA fellow rebel leaders. Before we left Myawaddy Major Saw Mote Thon emphasised his core message one last time. “Please tell people that we need investors. There are many opportunities here. It will all be for the good of our Karen people.” Earlier that day we had wondered about the benevolence of the DKBA Border Guard Force during a visit to Myit Tha Lin Myaing, a village under DKBA control. Some of its residents had participated in displays aimed at showing their happy lives under DKBA leadership. There were clear indications the villagers had been coerced to play along. A nervous village elder was scared to talk to us while a sergeant based in the village served as a go-between and a platoon of soldiers lurked in the background. We left the village and headed off into the darkness, braced for stops at illegal checkpoints. A week after our visit, the highway was closed by fighting. Whatever the November 2015 election will bring, the struggle for power in Kayin State is likely to continue for years. Myanmar is a patchwork of more than 130 officially-recognised ethnic groups, of which the Bamar is the biggest, followed by the Shan, Kayin (Karen), Rakhine, Mon, Kachin, Kayah and Chin and other smaller communities. The country was basically thrown together by the colonial British and has never been united around a common Myanmar identity. During World War II, the Karen, many of whom are Christian, sided with the British against the occupying Japanese army, which had attracted the support of Burmese forces loyal to General Aung San as part of a strategy motivated by a desire to achieve independence as soon as possible. Atrocities committed by both sides during and after World War II fuelled distrust and strengthened in the Karen a desire for an independent state, to be known as Kawthoolie (Flower Country). The Karen launched their struggle for autonomy in 1949, the year after Myanmar became independent. 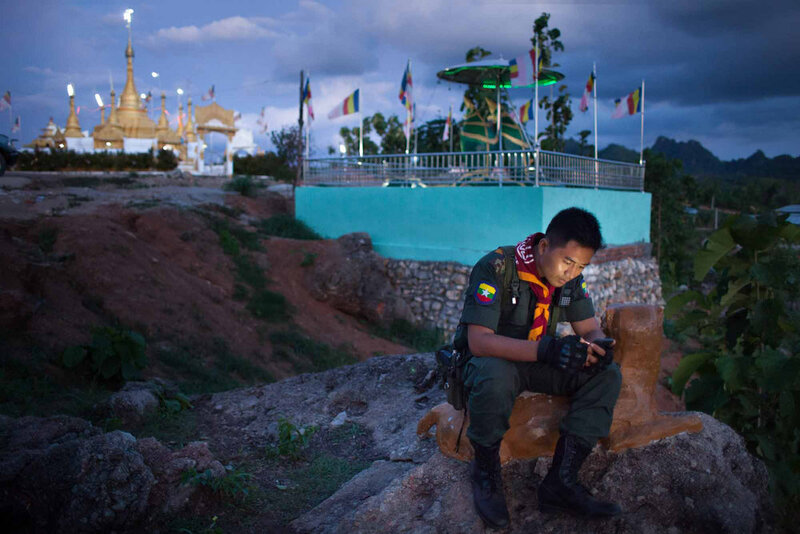 The Karen National Union, and its armed wing the Karen National Liberation Army, have led the struggle for independence. In the mid-1990s a big Buddhist faction broke away from the KNU and formed the Democratic Karen Buddhist Army, which signed a ceasefire with the government in 1995. 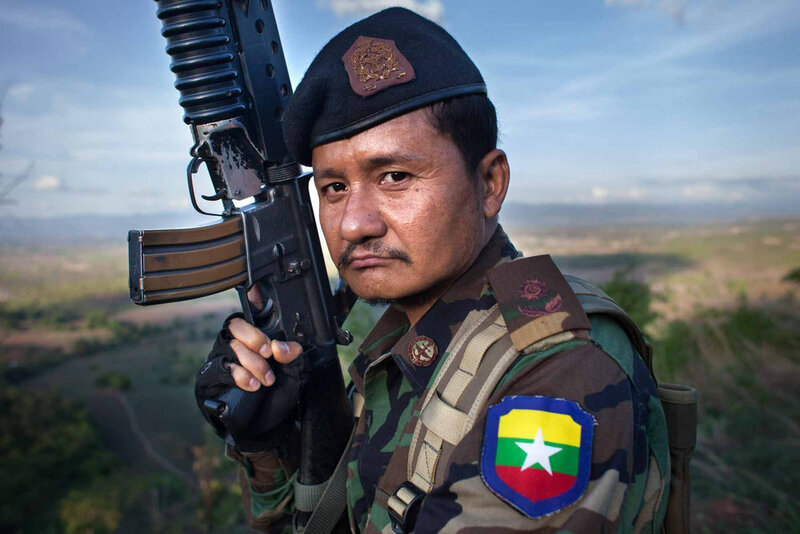 In the run-up to the 2010 election, the DKBA joined the government’s Border Guard Force scheme. A faction opposed joining the BGF broke away from the group and formed the Democratic Karen Benevolent Army. In January 2012, the Karen National Union signed a bilateral ceasefire with the government, ending more than 60 years of civil conflict. 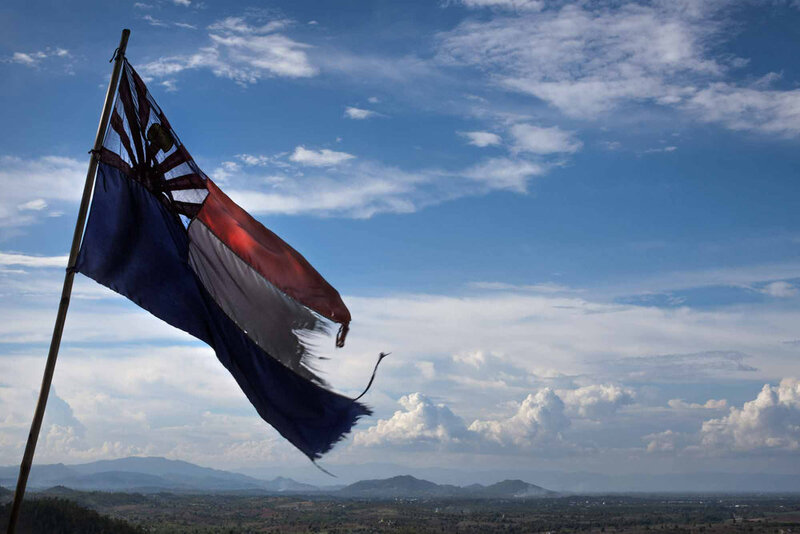 The KNU has since been playing a key role in peace talks aimed at achieving a national ceasefire agreement.